Well, it’s actually on October 19 in Hong Kong, but 10:00AM there time is actually 7PM Pacific on October 18 here in the states (10PM to all you crazy east coasters). 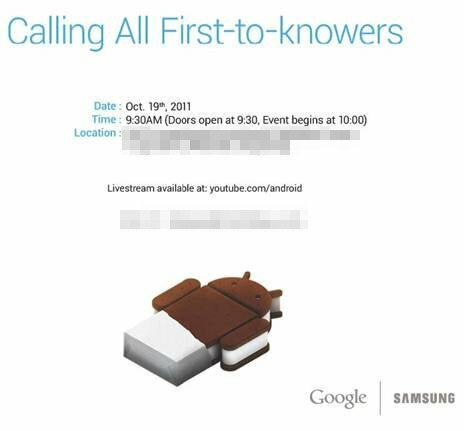 Disappointing that it won’t be a U.S. unveiling, right? It’s not surprising though, we first reported this news on Tuesday night and were fully expecting it to happen. Don’t worry though, we can all watch it together at youtube.com/android. Would have been nice to see it all unfold in San Diego in person this week though, but at least some of the mystery is gone. Cancel all plans, this should be good. And if there was any question as to the topic at hand (not that there was), I think the logo up top says it all. AGAIN, TUESDAY OCTOBER 18 AT 10PM EASTERN (7PM PACIFIC).